Juxtaposition is defined as the fact of two things being seen or placed close together with contrasting effect. 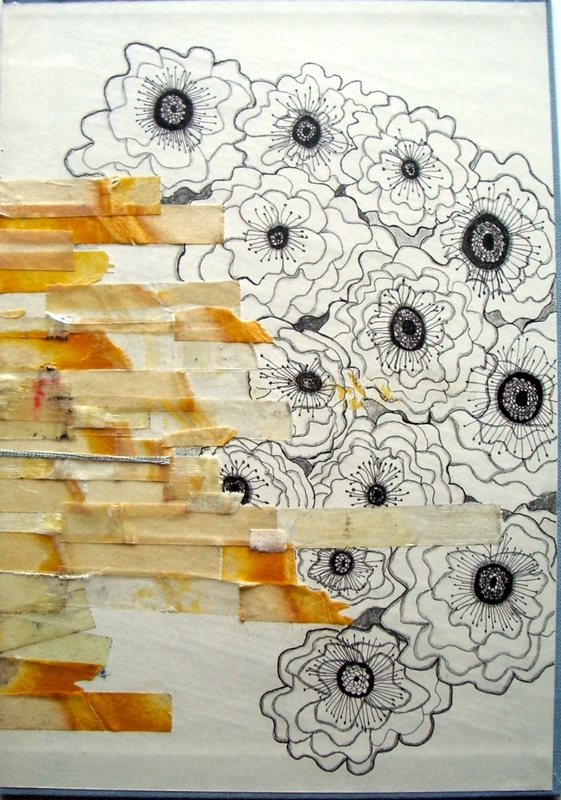 This was the basis for the Drawing Intensive students’ current project. What started as a sketchbook assignment ended up as a project. Having discussions with students about their purpose behind their work was so engaging and the outcome turned out great. WOW! What a great couple of weeks in the AIR program! You may remember Mel Kolstad, resident artist, talking about visiting with Mr. Soik’s Honors Humanities class for their first unit – well, he asked her back to consult with the students about their second unit, which deals with ancient Sumerian and Egyptian culture, The Epic of Gilgamesh and the samples of Egyptian literature. What they created was incredible, as you can see! Mel also met with Mrs. Reinemann’s Chemistry Club, which was SO much fun! The club made Solarfast prints and tie-dyed t-shirts! The students had a great time making these, and the project will be implemented in a future chemistry class. What a fun way to learn about photoreactive dyes! What a great week! Artist in Residence Mel Kolstad was able to hang out with Amy Jarvis, who came to visit before her talk with the Art Foundations kids next week in Mr J’s class, and they were invited back to Dr. Michels’ class for a potlatch, where the students celebrated their successes with food, singing and magic! Mel also spent some time in the IMC, where Ms. Gloede so generously invited her to take some of the discarded books from the library. She says she had a wonderful time looking through all the books, and took some for future projects! One of the pieces that she created includes some old cellophane tape that had yellowed, and she used that as the foundation for this piece. There is beauty in the mundane! 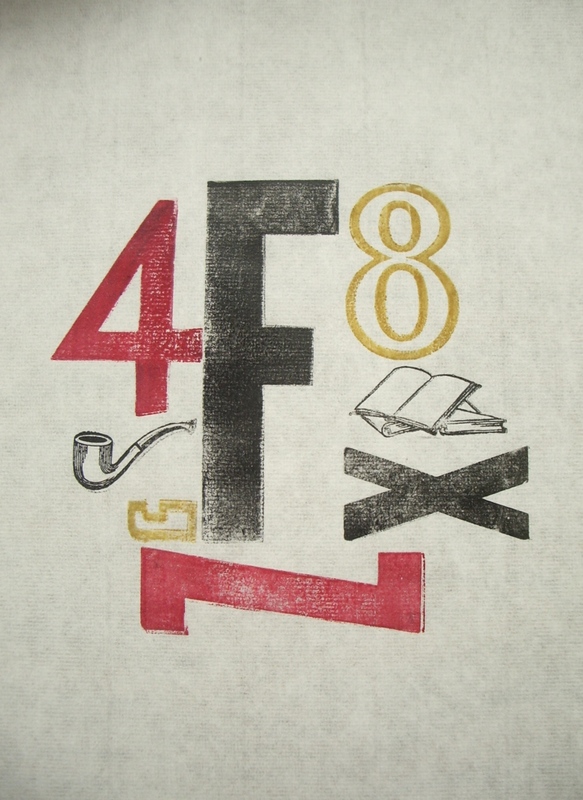 Mel also used her backpack press to create this 3-color letterpress print. 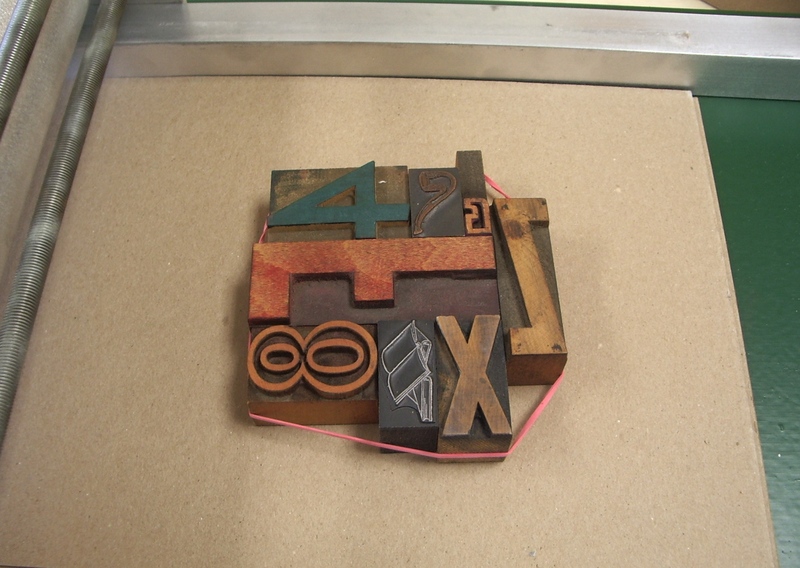 In a true letterpress studio, the printer would use what’s called a lock-up to secure his or her blocks and cuts. It’s amazing what rubber bands can do in a pinch! Another big week of happenings with the AIR program! This week Artist in Residence Mel Kolstad was able to see Dr. Michels’ students’ “Mind Maps” that were created in the African/Asian Studies classes during 1st, 2nd and 4th hours! As you can see, the students put a LOT of work into these pieces, and they turned out wonderfully! Thanks again so much to Dr. Michels for allowing Mel to visit his classes – what an enriching experiece. Mel also got to meet Sara Willadsen, a painter from Sheboygan, who will be the 3rd quarter Artist in Residence! She gave a talk in Mr. J’s classes, and then she and Mel hung out in the studio for a while. 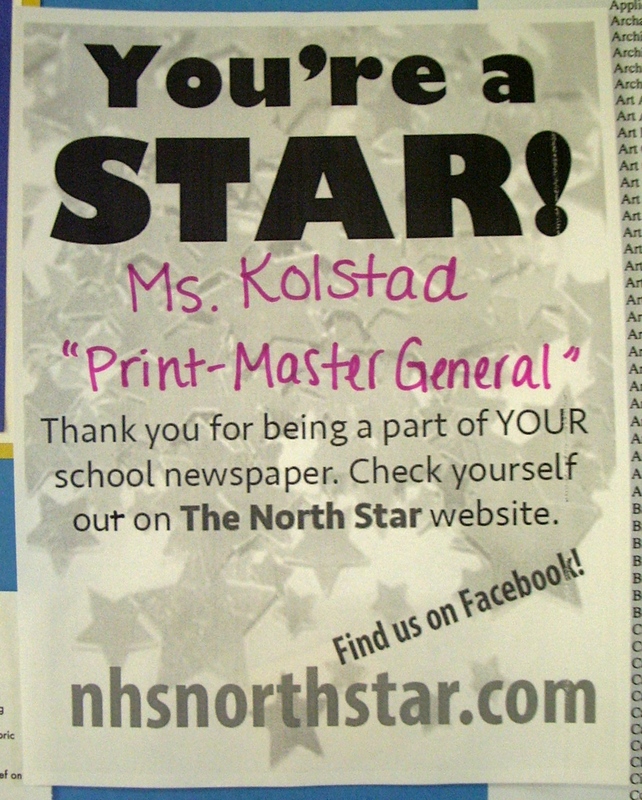 What a great addition to the North High Art Department! AIR Mel Kolstad is happy to say that she met with Dr. Michels’ African/Asian History and Cultural Studies classes last week, and will be advising them on their “mind maps” they’ll be creating for their unit on African Cultural Groups. 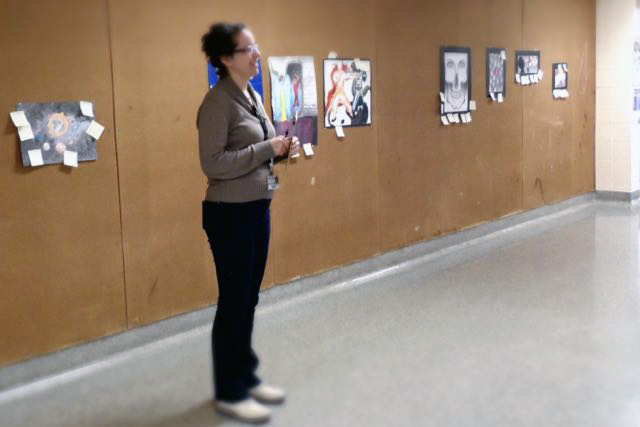 As she meets with them further, she’ll have some photos of the students’ work to share. She is looking forward to seeing what they create! Here are some snapshots of what they are doing in class. Images are taken from my Art Foundations 1 classes to my advanced classes. There will be more added to this gallery during the school year. 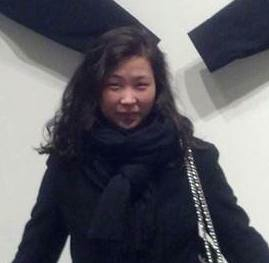 Molly Sampson has over five years of New York City contemporary art gallery experience. She travels to New York frequently to keep on point with the current art market but stresses the importance of exploring local art markets. She lectures undergraduate students on professional practices in the art world and teaches art history courses on Graffiti Art. She wrote her Master’s thesis on the birth of the graffiti movement in New York and focused her research on the role of the blackbook. Currently, she is on the committee to create art education programming to start in 2016 for the ARTgarage in Green Bay, WI. Past curated exhibitions include: Off the Walls and Post No Bills (Summer 2013), Love Me (Summer 2012), and Graffiti NYC: Artists of the Third Rail (Summer 2010). She received her MA in Modern and Contemporary Art, Connoisseurship and the History of the Art Market from Christie’s Education, New York and her BA from The George Washington University, Washington, DC. To learn more about Molly visit her at mscontemporary.com.